The scene on top of the Devon Ice Cap in Nunavut, Canada. Some 2,500 feet below lies a super-salty subglacial lake. 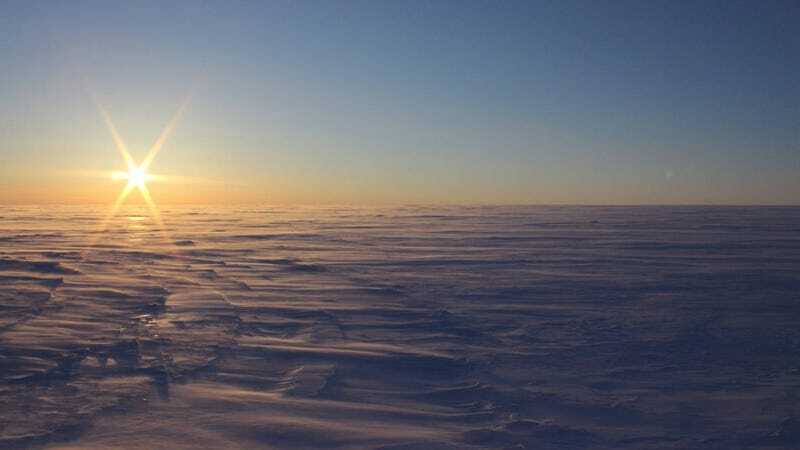 Researchers working in the Canadian high north have discovered two super-salty lakes buried deep beneath the Arctic ice. Untouched for thousands of years, the subglacial lakes may provide a tantalizing glimpse into the kinds of alien life that might exist on Europa and Enceladus, two ice-covered moons in the far reaches of our Solar System. The two subglacial lakes, located at depths of 1,800 and 2,500 feet (550 to 750 meters), were detected by researchers from the University of Alberta beneath the Devon Ice Cap in Nunavut, Canada, according to research published this week in Science Advances. Over 400 subglacial lakes are known to exist around the world, including many in Greenland and Antarctica, but these are the first to be discovered in Canada, and more importantly, they’re the first “hypersaline” lakes to be discovered anywhere on Earth. Packed with three to four times the amount of salt found in seawater, these lakes remain in a liquid state despite temperatures reaching -18 degrees Celsius. Anja Rutishauser, a PhD student at the University of Alberta and a co-author of the new study, accidentally discovered the subglacial lakes while conducting a geological survey of the area. Assisted by University of Alberta glaciologist Martin Sharp, University of Texas at Austin geophysicist Don Blankenship, and others, she was able to confirm the presence of a hypersaline subglacial lake complex. The lakes, which measure about two and three square miles (five and eight square kilometers) in size, aren’t connected to any known sources of meltwater. Excitingly, these super-salty lakes, with their cold, liquid water, are potential hosts for microbial life—and reasonably good approximations of what the conditions might be like on Jupiter’s moon Europa and Saturn’s moon Enceladus. Both of these moons are covered in ice, and feature vast subterranean liquid oceans. Ideally, scientists will collect water samples from the lakes to determine if microbial life exists down there—a cold environment with no sunlight and practically zero energy. Anja Rutishauser at work on the Devon Ice Cap. Before that happens, however, this team will partner up with the W. Garfield Weston Foundation to conduct a more detailed airborne geophysical survey this spring, starting in May 2018.